There is a metate in use in this ranch kitchen. Metates, of course, are the traditional method of grinding grain into flour, dating to pre-Columbian time. Costa Rican metates can differ from Mexican metates because often they do not have a rim on the edges. Despite the facts that the indigenous people of Costa Rica were nearly wiped out in Spanish colonial times, and Costa Rica is the most prosperous country in Central America, with literacy and health care comparable to the USA, and with an average income triple that of Nicaragua, our northern neighbor, this ranch family makes bread using some of the same methods that have been used for 1,000 or more years. I love these traditions. This week we have photos of a mussel ranch in Nova Scotia on our Viva la Voyage travel photo site. The kitchen pots are stored by hanging them from nails on the outside of the house, within the outdoor kitchen cooking area. They could do a lot of cooking for a big family gathering with so many large pots and kettles. With this storage system, you would never have to wonder where you keep a particular pot. Today is Sunday, so we have new photos posted on our Viva la Voyage travel photo site. This week we are showing photos of a mussel ranch in Nova Scotia. If you don't know how mussels are harvested, you are in for a treat. This is the stove in the outdoor portion of the kitchen. It is a wood stove, with an iron bar across the top to support skillets and kettles. You can see the wood sticking out from the right side of the stove. There is a lot of ventilation in this outdoor cooking part of the kitchen. It is under roof, but the walls are the chain link fencing that you see above the stove. Cooking here would be sort of like cooking on a camp fire on a counter top on a porch. This week we have photos of the Atacama Desert of Chile on our Viva la Voyage travel photo site. If you have not been there, it is worth a visit to our website to see unique, colorful landscape. Kitchens are perhaps the most common source of still life paintings, so here is a Costa Rican ranch photographic version of a kitchen still life. The ranch has a variety of livestock and poultry, and there is a variety of eggs in this bowl on a kitchen counter. Tomorrow, we will take a look at the outdoor kitchen. This is the ceiling of the kitchen. I took this photo to show the ventilation near the ceiling. This is especially important because the primary roofing material in local Tico houses is corrugated metal. There is no insulation. You can imagine that on hot sunny, days, the heat would transfer through the metal roof. The high ceilings and open ventilation on each side will help keep the house cooler. The metal roofs must be very noisy when there is a tropical downpour. This is part of the kitchen of the ranch house. The sink is on the left, the kitchen table on the right, and there is a refrigerator to the right, not visible in the photo. Pablo is pouring some tea. The area for cooking is on the outside, through the door in the corner behind Pablo, which keeps the kitchen cooler. I will show it in a few days. This is a giant brick of cheese that was being smoked in the smoke room inside the house. The walls of the smoke room are thick, as the last thing that one wants in the warm Costa Rican climate is a fire adding to the warmth. When I first saw that there was the equivalent of a smoke house inside the ranch house, I thought it would be for ham or other meats. I was surprised to see such a large block of cheese being smoked. I presume that smoking cheese preserves it without refrigeration. It would certainly add to the flavor. Several people yesterday left comments about the smoke inside the house. It was not smoky at all until he opened the door to the smoke room. Normally the smoke stays in the smoke room and out of the rest of the house. When we stepped inside the house, we encountered a room inside with one low door, and when our host opened the door, smoke poured out and there was a fire on the dirt floor of the room. Tomorrow, I will show you why. This photo is a closer view of the leather bag on the chair that I showed yesterday. The names of the ranch, Hacienda LaPinta and Hacienda Guastomate are engraved onto the leather on this bag. I admire that human cultures, from the earliest civilizations to modern times that include quality workmanship and decorative touches to everyday objects. Well, enough for photos of the porch. Shall we go inside? Come back tomorrow and we'll have a look. Today is Sunday, so we have new photos on our Viva la Voyage travel photo site. This week we are showing photos of the Atacama Desert in Chile, the driest desert in the world, featuring a unique, colorful landscape. I suspect that these porch chairs are home made. Costa Ricans commonly have wood furniture, and it is common to see chairs on a porch, as Ticos spend more time outside than people in the USA. Rocking chairs with leather seats and backs are also common. This week we are showing photos of the public art and classical architecture of Chicago on our Viva la Voyage travel photo site. Here is the back porch of the ranch. I love the rustic patina and rich colors of the wood floor, walls and furniture. This photo is a view from the back porch shown yesterday, looking back to some of the several pastures that are part of this ranch. Although the there are several pastures separated by fences, the pastures did not seem to be segregated by type of animal. Cows, horses, goats, and ducks all seemed to share the same pastures peacefully. This photo shows the back porch of the ranch house. I think this ranch decor could almost be universal. 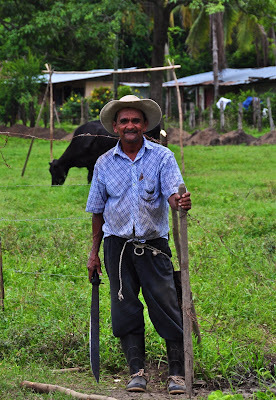 This Costa Rican scene could be in the American West, or rural Appalachia, or Patagonia. As you can imagine, for two photographers like Julie and me, a visit to this ranch was a "target-rich" environment. To get you oriented for the photo tour of the ranch, here is a photo of the ranch house. The house is on the right, with a slightly higher roofline than the covered pig pens in the foreground. There is a corral behind the fence on the right and a stable with cattle. There are several other fenced corrals for other animals, and the entire pasture is fenced. In fact, there are several pastures with horses, cattle and goats. This is a photo of the hosts who opened the ranch for our visit. Behind them are the covered pens where they keep the pigs. On the left if Pablo. He is the gardener at our Langosta condo. He knows that Julie and I like to take photos, and he asked us if we would like to visit a ranch for a photo shoot. Of course we enthusiastically accepted his invitation. The rancher who opened his home and ranch to us is on the right. Like most people, Ticos do not generally invite strangers into their homes. This rancher allowed us to go through his house, taking photos like crazy, which must have seemed rather strange and nosy to him. Of course we gave him and Pablo a nice tip. We will show more photos of our visit in the days ahead. Here is a photo of the rancher whose horse I showed yesterday. As we drove up to the ranch, he happened to be out front doing some repairs to the barbed wire fence. He has a weathered look, and a very comfortable pose. I also like that he keeps things tied around his waist with a rope. Today is Sunday, so we have new photos posted on our Viva la Voyage travel photo site. This week we return to Chicago to show some photos of the public art and classic architecture of a great city. 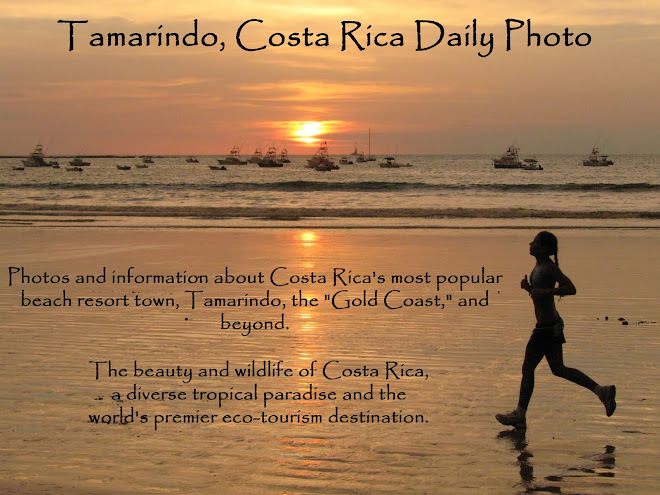 Today I will begin a series on a typical Costa Rican ranch near Tamarindo. As we arrive, we find this horse tied to a a fence post out front. This is a working ranch horse, not a horse for trail rides for tourists. A horse tied to a fence post without a rider should be a clue to what the cowboy was doing, which I will show during the next couple of days. We are showing photos of the village of Cernobbi on the shores of Lake Como, Italy, this week on our Viva la Voyage travel photo site. Playa Langosta means lobster beach in Spanish. This photo shows why. These lobsters were caught by some local fishermen. They took the lobsters out of their bucket and laid them on the sand so I could take a photo of them. I am showing this photo because my wife is away in Nova Scotia right now with some friends on a vacation that I could not go on because I had some things at work I had to do. Julie said she was going to be having a lobster dinner tonight, so here is a photo to illustrate her dinner about 5,000 miles away. In the future I will show a series of photos of the fishermen casting their nets at the entrance to the Langosta estuary. But first, I will begin a series tomorrow showing life on a nearby local ranch. I appreciate the kind and tolerant comments that people left regarding my failure to taste the food offerred by the kind lady I showed during the past few days. Because people seemed to enjoy the photos of a local woman in an outdoor kitchen, I have a treat in store for you. After today and tomorrow's photos, I will show a series of photos of a visit by Julie and me to a local ranch. The local family opened their house, their kitchen, their smoke room, and more for Julie and me to photograph their livestock and their way of life. I think you will find it of interest. But first, I will show this photo of Langosta Beach, right in front of our condo, as it is the magnet that draws us to Costa Rica. Behind the trees in this photo is what is called "millionaire's row." I will show the photos of the beachfront mansions behind the trees in the future. Here is the food that the village lady offered me. I think it is a tamale, which is usually made from corn meal stuffed with chicken or pork and boiled in banana or plantain leaves. I have two confessions that will rightfully disappoint you, especially some of my readers who left comments saying that they looked forward to the post of the local food in anticipation that it would be delicious. My confessions are that I am not very adventuresome when it comes to food and I have a very limited vocabulary of Spanish, so I did not know exactly what was in this dish and I do not experiment with food unless my wife, Julie, is with me and she can tell me if I will like something or not. Julie was not with me on this trip. My excuse for the limited range of my palate is that my late parents prepared me for the world in many ways, but not food. We never had Mexican food, or even pizza, and I did not realize until I went to college that spaghetti came in anything other than a can. I never took Spanish in school. I took Russian. I go down to our condos in Costa Rica as often as I can, but I still work full time in Arizona so I stay in Costa Rica in short intervals, not enough time to learn Spanish. And in Tamarindo I do not need to know Spanish because everybody speaks English, as it is a tourist town full of foreigners. I am determined to learn Spanish in the near future. In addition to offering us food (which I will show tomorrow), the local folks offered us a drink that they made. My half full (or half empty) glass in this photo shows the drink. Throughout Latin America chicha is a term used for local drinks made or brewed at home, rather than commercially. There are many variations. It is usually made from corn, is often fermented, and sometimes fruit is added. Chicha is especially common in Peru, and in the Andes typically people will hang a red flag out their doorway to advertise that they have chicha for sale, usually in a bucket. I have never had chicha before the glass you see here. 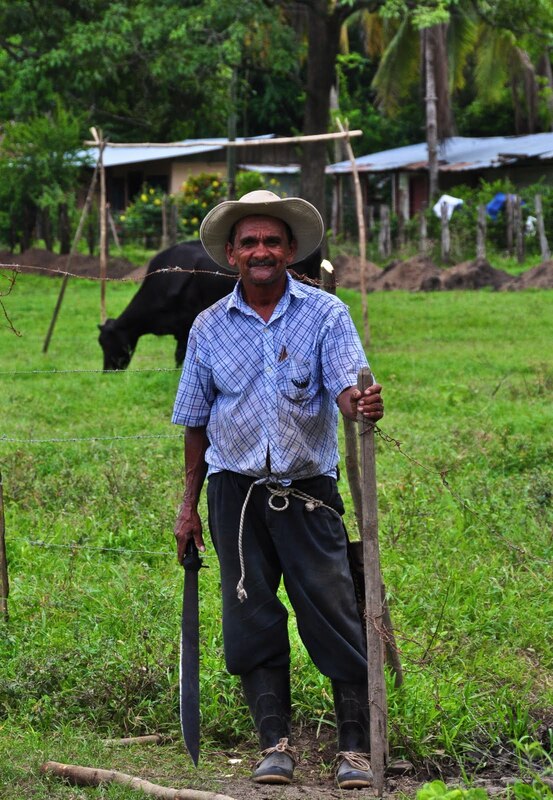 In Costa Rica the water is safe to drink, even for Americans like me, and even in little rural villages. I would never drink the chicha in places like Peru. I do not drink beer, as I never acquired the taste. I did not care for the chicha, either, but drank it to be polite. I really appreciate the comments people left yesterday about their expectations for the food that they offered to me. I will show it tomorrow, but I will have to make two confessions that will expose several of my faults and disappoint you. I apologize in advance. During the past week I have shown you an elegant lobster tail dinner at a restaurant at the ultra-luxury Four Seasons Resort. It is like a slice of Hawaii in Costa Rica. Today, I will show you a local scene. This is a little kitchen in the village of San Vicente, next door to the museum for Chorotega pottery that I have shown in the past. After we bought about 25 pieces of pottery as gifts for the people in our office back in Arizona, the lady who was working in the museum invited us to have a little food and drink. We walked next door with her to the little kitchen where she was preparing some food. I will give you a better look during the next couple of days. Here is another photo of a coati, the animal that I showed about a week ago for the "mystery object" theme on Oct. 1. This is a different coati than the one on the rock I showed previously. He was walking across a grassy area next to the golf course. This shows a coati in a typical activity of foraging around close to dusk. He is less interested in us than we are in him. They do not bother people. This coati is used to being around people, as he is on the Papagayo Golf Course and there are homes and a hotel nearby. I have come across a family of coati's in the jungle who ran off and disappeared quickly. His full body length is 27 inches (69 cm) from head to the base of his tail, and a bushy tail about the same length as his body. They are members of the raccoon family. They have a long nose that they can rotate from side to side. They have double jointed ankles and claws to enable them to climb trees easily. I imagine their long tails help for balance. Coatis are native to Central America and South America as far as the northern end of Argentina. Today is Sunday, so we have new photos on our Viva la Voyage travel photo site. This week we are showing photos of the village of Cernobbi on the shores of Lake Como, Italy, from our trip last summer. For my main course at El Caracol, I had local, Costa Rican lobster tail. The Pacific waters of Costa Rica are much warmer than the north Atlantic, and lobster in the cold waters of Maine are unmatched, but Costa Rican lobster tails are still very good. I hope Julie is enjoying fresh lobster this week, as she is right now in Nova Scotia with good friends to attend the Celtic Music Festival on Cape Breton Island. I had to cancel going on the trip because some matters came up at work. Maybe I'll just have to go out and enjoy another lobster dinner so I don't feel as bad about missing this vacation. This week we are showing photos of some of the quietly beautiful scenes of Yosemite National Park on our Viva la Voyage travel photo site. Several people leaving comments have wondered what the food was like at El Caracol, and I will share our meal with you, least through these photos. Julie loves oysters and she will usually order them for appetizers when she is sure that they will be fresh and good. And at El Caracol they were. They were served on a bed of ice in a bamboo tray. The candle on each table at the Caracol Restuarant is set inside a shell candle holder. Caracol means shell in Spanish. If you look at the shape of the opening in the shells used for candle holders, you will see that it is also the shape of the entrance to the restaurant. 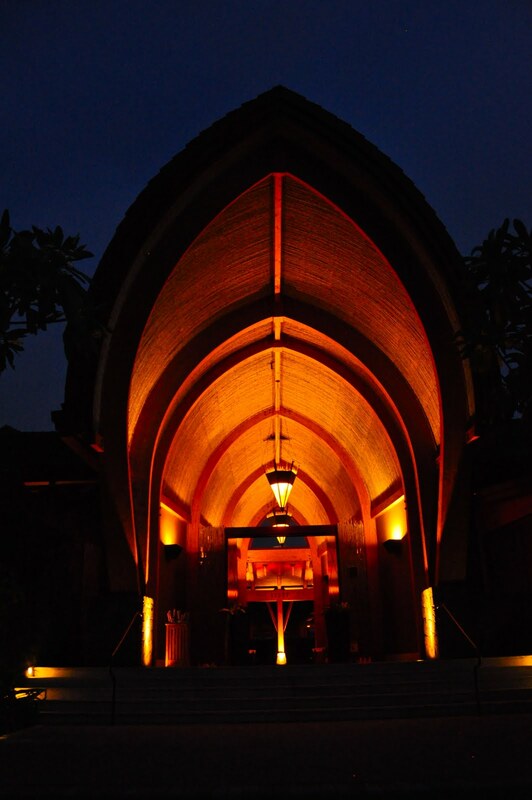 The exterior view of the restaurant that I showed several days ago also showed that the circular design of the restaurant is composed of a series of arches in the roof line that are also shaped like shells. 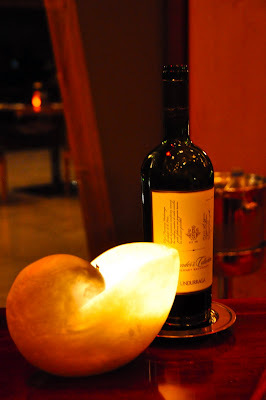 I will share with you the dining experience that we had in my next few posts. It will save you a couple of hundred dollars. Upon arriving at the El Caracol Restaurant, this is the entryway that will greet you. I think you can tell that you are in for a fine dining experience, and an expensive tab, just by looking at the entrance. 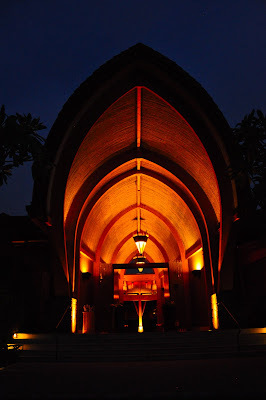 There is significance to the shape of the entrance that also ties in with the name of the restaurant. I will explain that tomorrow. Here is an aerial photo of the same scene that I showed yesterday. In the center left of the photo is the El Caracol Restaurant and the golf course support buildings. In this photo you can see how the golf course snakes down the spine of the peninsula, with views of the Gulf of Papagayo on one side and the Pacific Ocean on the other. This photo is the El Caracol Restaurant at the Papagayo Golf Course. This is located about half way down the Papagayo Peninsula. We have eaten here several times, as it is possible to make a reservation here even if one is not a guest at the Four Seasons Hotel, which is located farther down the peninsula. The golf course pro shop is also located in this building. I bought a golf shirt with the Four Seasons Costa Rica logo on it. Maybe people will think I have stayed at the hotel or played golf there, neither of which would be true. I will continue this series to share with you the dinner that Julie and I enjoyed at this restaurant. This is another view of the Coati that I showed yesterday, which I am posting today to give you a better view of his body. After he stopped and yawned right in front of us, he climbed down from the rock and walked off. He looked at us several times and was not in the least bit scared of us. Coatis are sometimes hunted by humans. They also have a few predators, such as jaguars, ocelots, foxes, and even some eagles and white faced capuchin monkeys will attack their young. Coatis are relatives of raccoons, and are smart like raccoons. They like to sleep up in the trees. pregnant females will leave their groups and build a nest in a tree or on a rocky ledge. Six weeks or so after giving birth to a litter of 3 - 7 kits, the mother and young will rejoin the group. Coatimundi is a term for a solitary male coati, although some people use that term incorrectly to refer to any coati. Today is Sunday, so we have new photos on our Viva la Voyage travel photo site. This week we are showing photos of Yosemite National Park in California. We are featuring some scenes that are different than the landmarks that you usually see. The worldwide Daily Photo Theme for Oct. 1 is "mystery object." Because Costa Rica is the number 1 ecotourism destination in the world, I chose a living creature as my mystery object. I was able to choose this photo for theme day without interrupting my series on the Papagayo peninsula, as this creature emerged from the bushes as Julie and I were photographing the sunset, standing on a street right next to some expensive homes under construction. Because the theme is for a mystery object, I will continue the mystery for another day for those of you who do not know what this is. Unless you live somewhere from Brazil to Mexico, you have not seen these animals, except perhaps in the zoo. In Costa Rica, we see them usually at dusk. This week we are showing photos of the Music Palace in Barcelona on our Viva la Voyage travel photo site.